All winter long people in the Green Hollows have prepared for a final battle with Gnag the Nameless and the Fangs of Dang. Janner, Kalmar, and Leeli - Throne Warden, Wolf King, and Song Maiden of Anniera - are ready and willing to fight alongside the Hollowsfolk, but when the Fangs make the first move and invade Ban Rona, the children are separated. Janner is alone and lost in the hills; Leeli is fighting the Fangs from the rooftops of the city; and Kalmar, who carries a terrible secret, is on a course for the Deeps of Throg. Meanwhile in Skree, Sara Cobbler and Maraly Weaver care for the broken Artham Wingfeather as Fangs muster for battle across the Mighty River Blapp. Sea dragons lurk in the waters. Wicked Stranders crawl through the burrows. Ridgerunners and trolls prowl the land. Cloven haunt the forest. Monsters and Fangs and villains lie between the children and their only hope of victory - in the epic conclusion of The Wingfeather Saga. This has been an absolute thrill to read. 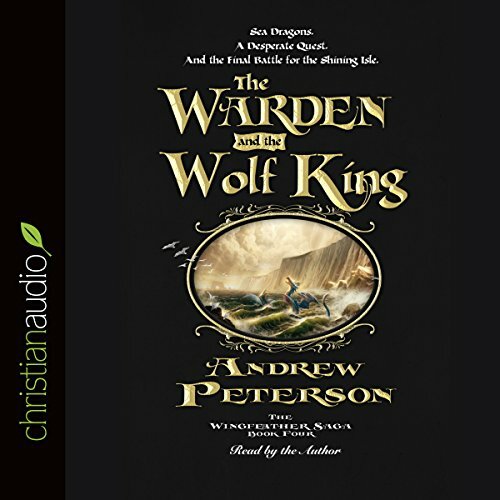 The epic conclusion to an excellent saga, The Warden and the Wolf King is a moving allegory for the sacrifice Jesus made for us. Aside from the thrilling adventure and suspenseful storyline, this tale will be in my audio and print library for a lifetime. The only series we have read that rivals the Chronicles of Narnia. If you are looking for stories that your children can grow up on, this is it. Harry Potter is fine and entertaining but the Wingfeather Saga is character shaping. Gosh. This is the perfect book series. A story of faith, salvation, friendship, love and adventure. I cried on and off throughout the series. I really 'love' Andrew Peterson, and REALLY appreciate all the work he put into this story. He really has a great talent with words. I'm really bummed that the series had to end. Although it was the perfect ending, I have to admit. Please read it! But if you are read all the other books on the series first. Really worth the money. Ages 7-107. Really any age will love it, I bet. Gosh, I can't get over it and the other reviews didn't do it justice! Love love love! Om. This is the greatest book ever. 99999999999999999999 thousand stars. U should read or listen to dis book. The most amazing resolution to the first three books! Ugly crying doesn’t even begin to do this book justice. Andrew Peterson concludes this work wonderfully. It is read tremendously well by the author, and the story is insightful and spectacular. The characters brought me along the journey of laughter and of tears. I loved every moment. Please read/listen to this series. This is the finale to the Wingfeather Saga and it is good. Only complaint I have is the ending feels a little abrupt, but it was still a good book. Plus if you have read the first 3 you have to read the final one. Good narration by the author.